With the development of the public trolley system, settlement beyond Syracuse’s urban core could be realized and the farmland to the east of the downtown area opened to development. The first true subdivision in Syracuse was The Highlands in 1872 on a hill southeast of the urban center. The new development coincided with the completion of the Hall of Languages, the first building of Syracuse University. University Heights, developed by Maurice Graves (1846-1922) in 1895, followed this subdivision to the south and east. That development began along University Place, proceeding south to Popular Avenue (now Strafford St.) and east from Comstock Avenue to Sumner Avenue. 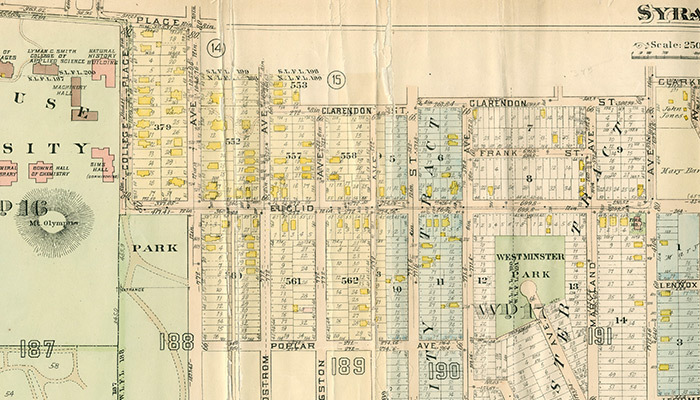 In 1890 a new tract just to the east was developed as The Westminster Tract, and it is one of several large residential areas platted in the late 19th century and opened to development that straddle present-day Euclid Avenue. This tour will explore the northern part of the Westminster Tract. The name Westminster was apparently chosen by the developers, perhaps to give the cachet of culture and history, evoking the area around Westminster Abbey and Palace of Westminster in London, seat of the government of England for almost a thousand years. Street names in the area, especially those adjacent to the tall drumlin that occupies the center of the tract were given English names – Lancaster, Buckingham, Kensington and Westminster. New opportunities in the area seemed to have attracted a number of young architects not only to work – but also to live. Architects Clarence S. Congdon and Justus Moak Scrafford designed houses for themselves in 1909 and 1910 respectively and on this tour. From 1908 Alfred Taylor lived at 408 Euclid (now 422 @ SW corner with Strafford), and later at 608 Ackerman (between Clarendon and Thornden Park), both of which he may have designed. In 1912 Edward H. Gaggin was living at 111 Clarendon Street (numbers have changed, so exact house is uncertain). 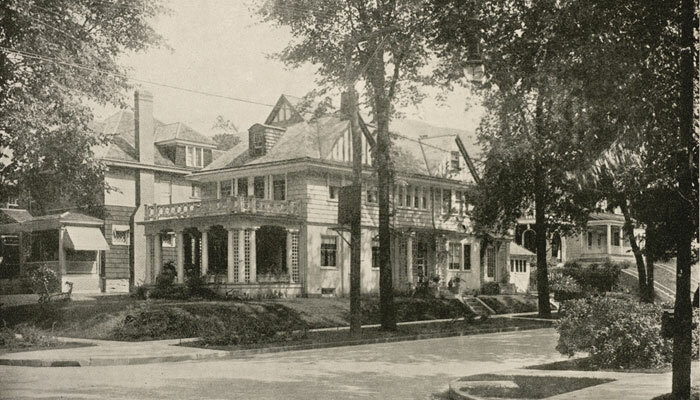 Mansfield French designed his own home in 1916 at the corner of Sumner Avenue and Clarendon Street. This elegant property adjoins the land of the University Homestead Association and is BISECTED BY THE ELECTRIC CABS of the Genesee Street and Crouse Avenue Branches of the Consolidated Railroad Company. Cars run on a seven minutes headway. The new Westminster Tract is suitably restricted against nuisances. It is in the midst of fine improvements and the approaches to it are unexcelled. It has SIDEWALKS. MAGNIFICENT SHADE TREES and well made streets and avenues carefully graded, and with stone gutters. It is on high ground, overlooking the heart of the city and commanding incomparable views of Onondaga Lake. A handsome waiting-room of the Electric line has just been erected on the property. Homeseekers, builders, investors, this is the chance of a century to buy at auction prices the most highly developed and attractive property in Central New York, and the only similarly improved property near Syracuse. Euclid Avenue is the secondary East-West artery of the Westcott neighborhood, running straight from the Syracuse University Campus (from College Place) to the former city line at Westmoreland Street. Today, Euclid Avenue continues to Meadowbrook and then ascends and winds its way northeast through the east end of the Scottholm development. The section of the street from College Place to Westcott Street was a graded in the late 1890s when the first developments began and the Post-Standard of February 28, 1901 reports requests that it be paved. We know that it was, since construction of Engine House 10 (now the Westcott Community Center) was contingent on the completion of paving, and the Engine House was completed in 1903. Traces of the original brick paving can often be seen beneath today’s asphalt surface. The streetcar ran down Euclid Avenue from Westcott to University Place. At first it was single track, and then before World War I a second track was added. The line ran until 1945. Brick pavement and streetcar tracks still underlie the present-day asphalt pavement. During World War I the Syracuse university campus was an army training camp, and Euclid Avenue served as a parade group with soldiers marching up and down the street. Euclid Avenue was once known for its trees. Initially, there were poplars, and then these were replaced by elms. Vosburgh writes that in the 1930s lower Euclid Avenue was a neighborhood with beautiful trees,which shaded the street until they were removed as a result of the devastating Dutch Elm Disease that struck the city in the 1950s and 1960s (the disease first appeared in the Sedgewick neighborhood in 1951, and spread from there). This tour covers the northern portion of the Westminster Tract that is bordered by Sumner Avenue on the west and Westcott Street on the east, including the blocks from Euclid Avenue north to Clarendon Street. The tour begins at the Westcott Community Center (former Engine House 10) at the SW corner of Westcott Street and Avenue, continues west on Euclid Avenue, turns north on Sumner Avenue, and at the top of the hill turns east on Clarendon Street. 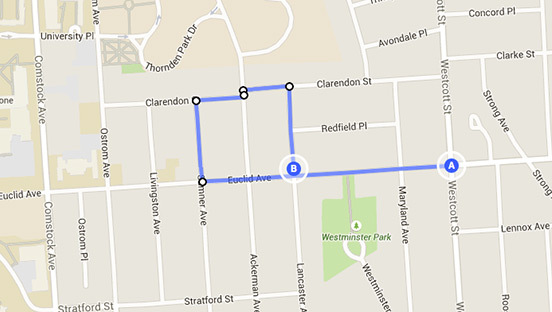 The tour passes the intersection with Ackerman, and turns south on Lancaster Avenue, returning to Euclid.